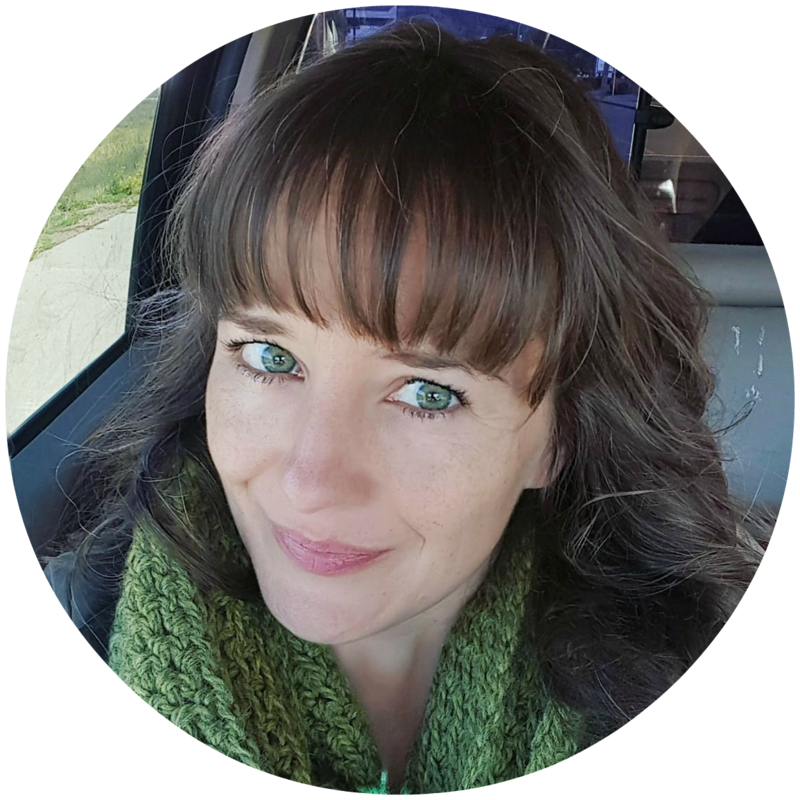 Today's Blogtober prompt: Your best/worst Halloween memory. Halloween didn't start for me until I was 23 years old. Isn't that sad?? You see, we don't celebrate it in Germany. At least we never did when I was younger - now it has made its triumphant way across the Atlantic, and European kids finally get to gorge themselves on way too much candy as well. That means that I missed out on all those teenage years of potential mistakes and drunken misdemeanors. Well, on Halloween that is - I still did enough of those on any old Friday night in the 90s and early 2000s. Since there is a lack of embarrassing/awesome Halloween pictures, I decided to approach today's topic from a different angle. 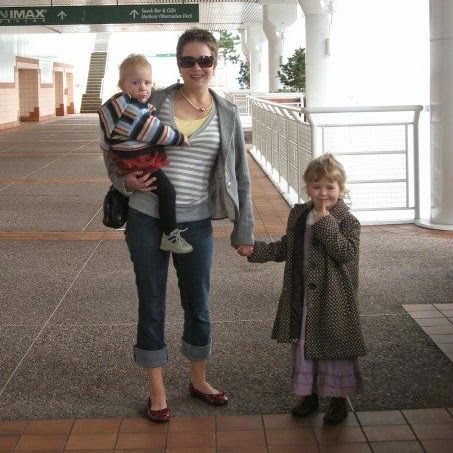 I have worn my fair share of misguided outfits over the years - either because I thought it looked awesome, or because I was working in jobs that I thought at the time were awesome. Let's walk down memory lane and see all the 'costumes' I have worn throughout the years, shall we? While we may not have had Halloween during my childhood, we had a worthy equivalent. It is our carnival, celebrated in February. There is no trick-or-treating, but everybody dresses up, there are parties galore, and you get up to much mischief. This is my all-time favourite costume from that time. I'm sure I don't need to explain why - it's a pink Ballerina costume! Also, I was wearing more lipstick at 4 than I do now. This isn't me. But shockingly (or fortunately), there are no pictures of me from my glitter phase. There was a time when I was obsessed with glitter. If you think that's totally normal for a little girl, I have to clarify that I had that phase when I was 18 years old. 18 and 19, to be brutally honest. Whenever I went out, I would generously apply glitter powder on every inch of exposed skin, and silver glitter in my hair. 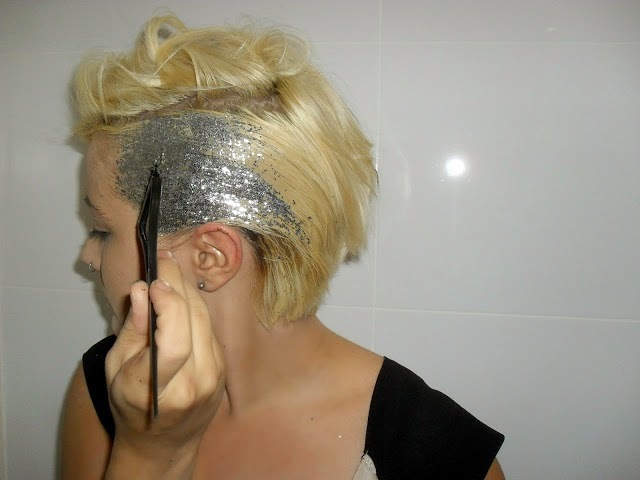 I had a short pixie cut at the time (and for about 12 years after that), and would spike it up with silvery glitter-gel, very similar to the picture above. That's how I roll: either no make-up at all, or disco ball. This is me, wearing an outfit I had to wear nearly every day for 6 months back in 2001. This is what happens if you don't pay attention in school: you willy-nilly choose a potential career based on the male-female ratio (8:1), the possibility of bringing your dog to university (and later to work); and the vague wish of wanting to work "outside". Be careful what you wish for, is all I can say: I had the privilege to work outside every day, from September-February, during an early and cold winter. In the forest, with lumber jacks. Because I had the misguided idea of wanting to be a forest ranger when I was 19. Not that it is a bad job, not at all - just bad for me. That facial expression tells you everything you need to know about how I felt about that career path. 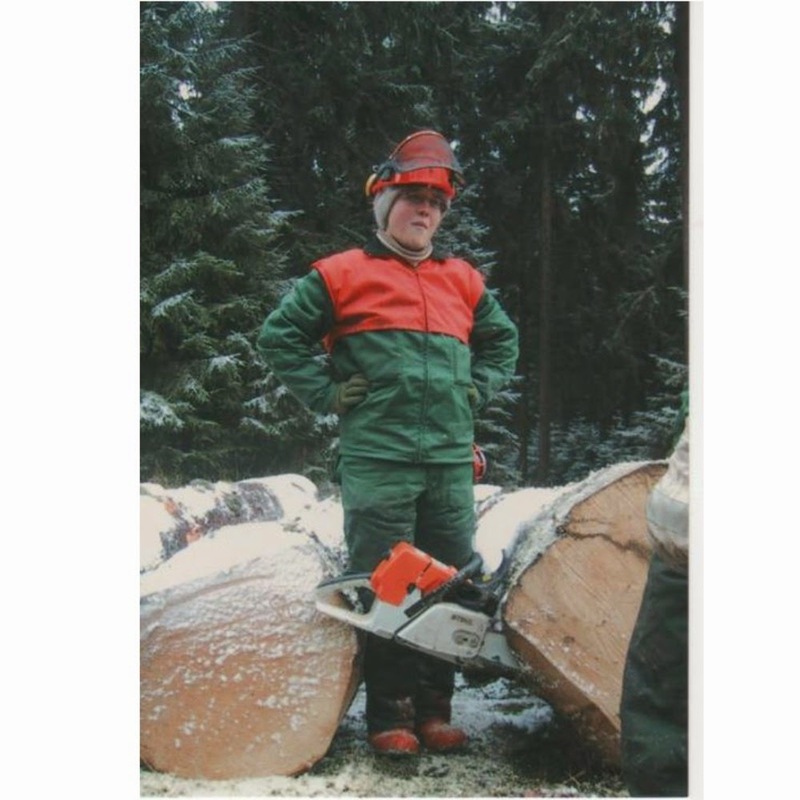 But it is very amusing to look back, pondering how I actually cut down trees at one point in my life. Another uniform I wore every day for 6 months. 6 months seems to be my limit for ill-guided careers? 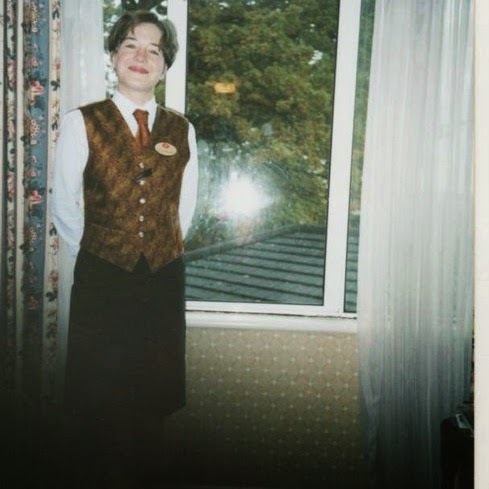 Here I posed as a Food & Beverage employee at a swanky 5-star hotel in Wales, UK. It's a long story how I ended up there - but now is not the right time to tell this story. It needs the proper context and background, to lead to the glorious, satisfying, happy ending. My best Angelina Jolie-impression - I like to call it Angie for beginners (only 2 kids, instead of 6. Or is it 7 now?). 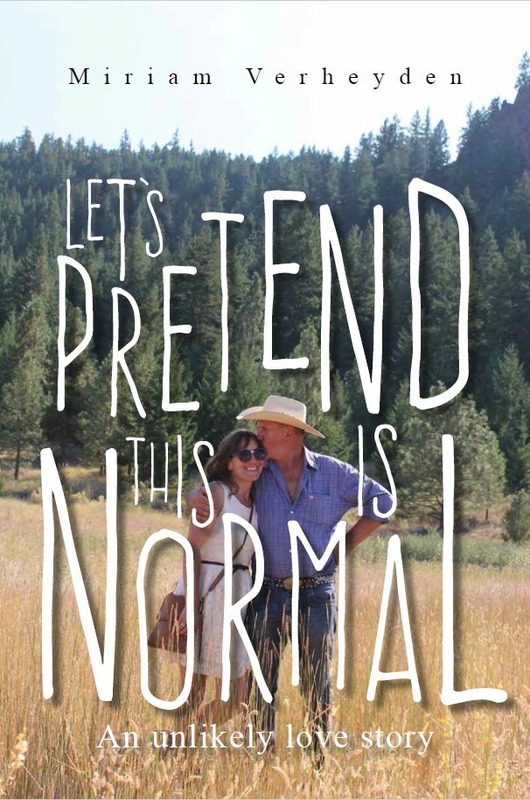 I thought I would give the dark shades/one kid on my hip/one kid on my hand-lifestyle a whirl. I wasn't fooling anyone: people can spy a fake like me from a mile away. What's your #tbt moment when it comes to Halloween? Link up with Taylor and Helene! let me just say thank you... for making me laugh SO hard hahahahahaha my two favorites are the ballerina and the lumberjack.. love it!! at least you had Carnival! I nearly missed Carnival this Feb for my daughter we arrive to her kita and all the kids are dressed up, I immediately call my husband to bring me an outfit for Avi. I love that you posted outfits instead of costumes. Such a clever idea and I would probably scare some people with my *costumes/outfits* from my high school days. Can I just say though,that I actually LOVE the plaid skirt and boot combo. oh it's so interesting to me how other countries don't celebrate it! but i love the glitter hair!! This post is awesome! I think it's funny to look back on previous outfits and see how ridiculous they look even though they were the style of the day. I wore light up shoes and had a feather weaved in my hair when I was younger and cringe every time I see that photo! Oh my gosh. This is maybe my favorite post that you've ever done. I love all the outfits. What a great idea to share them! My fav are the plaid boots - do they still make those?? I would rock them too! Those ribbon ballet slippers are AMAZING!!! I remember trying to fashion something similar growing up when my sister and I played dress-up. Love all of these throw back pictures!!! 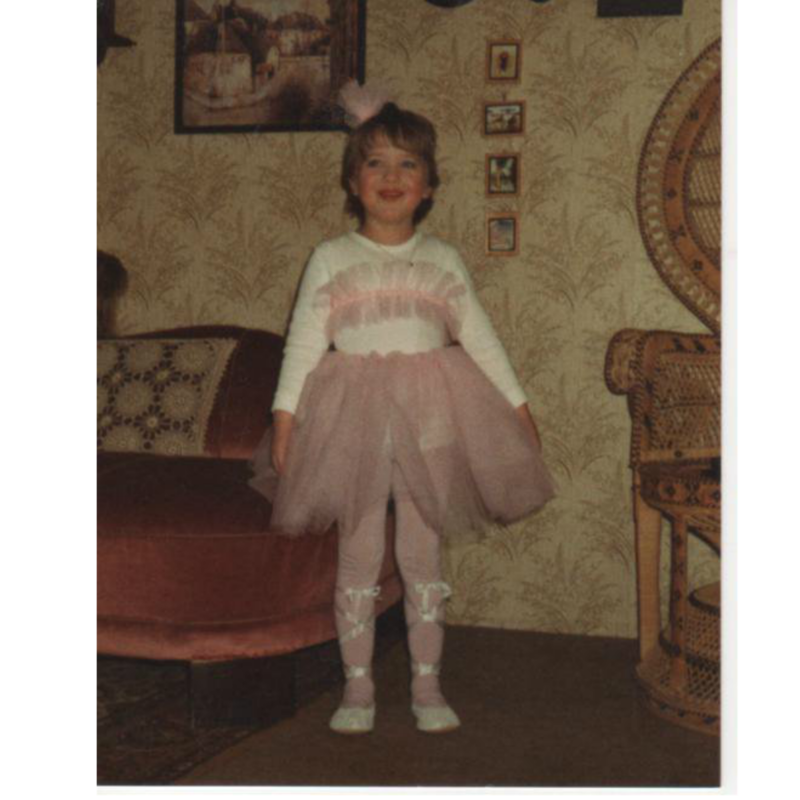 I was totally a ballerina...for SEVERAL years haha! I love the "costumes." The second picture reminds me of myself when I was in grammer school and High School. 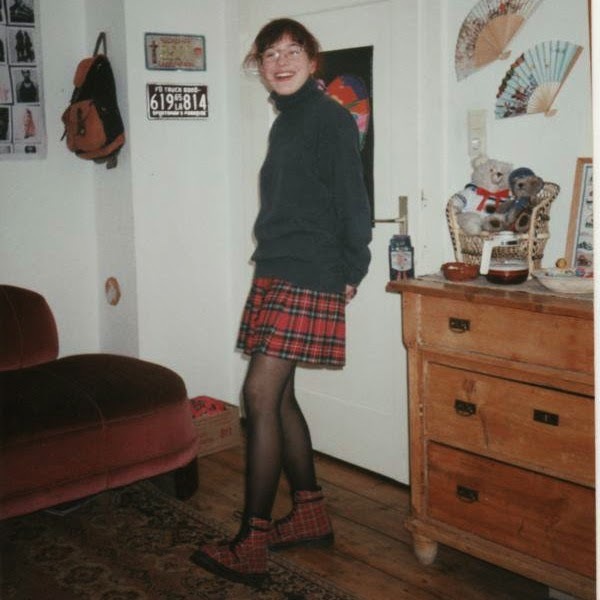 I wore many plaid skirts in my younger years going to school. And the glasses. Which, I still always wear. But, now they have rhinestones. And I'm still glitter obsessed. I rock the glitter eye makeup still. Even though I'm 27.